Oh! This is such a pretty card, Sylvie. Love the papers and gorgeous image. You got some really fab goodies at Ally Pally...lucky girl! As always, another fantastic card. So very sweet. No one cold beat your backdrop that's for sure!! Oh this is gorgeous Sylvie, absolutely love it. 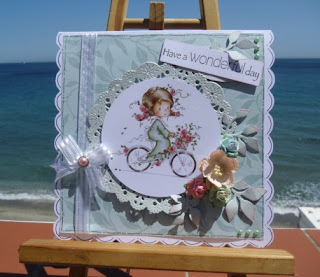 Nice card love your die it looks like a doily and your backing paper is pretty to. Awwww, how sweet is this?! Love that little girl and all the feminine embellishments are just perfect! Always love seeing the beautiful weather in the background of your projects too!! Thank you for joining us at The Paper Players! How gorgeous is that image! Love the flowers and wonderful coloring. Wow !A stunning card - she give so a sweet and romantic feeling - fantastic ! You colored it perfect. The Papers and flowers finished it fabulous !